Because of our current mobile society, most people may not realize how easily they could live within their own zip code. Of course, for some, that could depend on having a grocery store, a gas station, and maybe a Chick-Fil-A. I live in the 28422 zip code known as Bolivia, North Carolina. 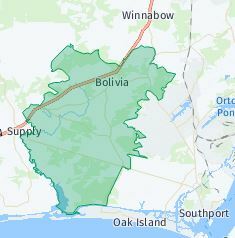 Most people who are familiar with Brunswick County in Southeastern North Carolina probably think of Bolivia as where you can find Brunswick Community College, Novant Hospital, and the County Government Complex. But, it encompasses so much more than a stretch of Highway 17. Bolivia borders St. James, Boiling Spring Lakes, Southport, Green Swamp and Supply. It covers 91.17 square miles and includes lovely housing communities such as Winding River Plantation, River Sea Plantation, Palmetto Creek, New South Bridge, Avalon, River Run Plantation, and is even home to Coastal Living Magazine’s 2009 Idea House in the Sea Watch community. Really? Bolivia? At one time, Bolivia even had a zoo. They hosted my son’s 8th birthday party! While Bolivia does not yet have its own brewery, you can sample brews as you shop for groceries at Lowes Foods in the Midway Commons Shopping Center. Okay, the Midway Commons Shopping Center may be a far cry from a big city mall, but not only can you stock your fridge and pantry there, you can dine at a few choice restaurants, get your hair trimmed, teeth cleaned, exercise, pick out paint colors and groom your dog! Perhaps you would prefer to hit the links at Carolina National Golf Club which is located within the Winding River Community and open to the public. Before playing 18 holes, you can warm up at their driving range and after, you can cool down in their handsome clubhouse. But, if that doesn’t float your boat, then meander down to the end of Sunset Harbor Road where you will find the Lockwood Folly River. There, you can literally float your boat at the public boat ramp, join the local fishing club or just kick back and view some of the best sunsets in the county. Hey, Sunset Harbor didn’t get its name for nuthin’. If you are looking for a different kind of serenity, you can discover a new culture at the Wat Carolina Buddhakakra Vanaram, Brunswick County’s only Buddhist Temple. The architecturally interesting Monastery, nestled on 21 acres off Midway Road, is open to visitors for worship or insight. And I do not want to forget to mention that Bolivia also has a shooting range, ATV and hunting club, a berry farm, and a Dollar General. I’m still waiting on that Chick-Fil-A though. So, what’s in your zip code? Next PostZillow 5 Star Rating!